Our mission is for a Sunday Assembly in every town, city and village that wants one! Look for Pippa & Sanderson Collectible Trading Cards (coming soon)! 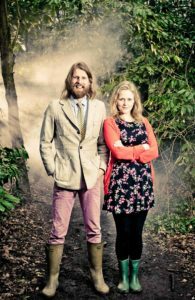 The Sunday Assembly was started by Sanderson Jones and Pippa Evans, two comedians who were on the way to a gig in Bath when they discovered they both wanted to do something that was like church but totally secular and inclusive of all—no matter what they believed. The first ever Sunday Assembly meeting took place on January 6th 2013 at The Nave in Islington. Almost 200 people turned up at the first meeting, 300 at the second and soon people all over the world asked to start one. Why do we exist? Life is short, it is brilliant, it is sometimes tough, we build communities that help everyone live life as fully as possible.